Here’s the problem. When an endemic sponsor — in this case Nike — is signed to a generation long contract as the footwear and apparel sponsor of your national athletics federation, there will be unintended consequences that fail to serve the best interest of one constituency or another over that period. That is the situation that currently confronts 2013 800 meter World Championships silver medalist Nick Symmonds who had until noon today to sign the USATF “Statement of Conditions” contract that attends his Team USA berth on the IAAF World Athletics Championships in Beijing, China later this month. Symmonds, formerly a Nike athlete, is now sponsored by Brooks. But under USATF by-laws, athletes competing at the world championships or Olympics (or other Team USA selected competitions) are prohibited from wearing non-USATF sponsored gear during “official team functions”. But with USATF signing Nike to a reported 23-year, $500 million extension as exclusive shoe and apparel sponsor for Team USA in April 2014, every athlete signed by any other shoe company finds him / herself in opposition to his/her own best interests since they will not benefit financially from the USATF deal with Nike — other than to elevate their future marketability by performing well on the stage provided. The situation is similar to the IOC generating $6 billion in sponsorship and TV rights from the Olympic Games, none of which is distributed directly to the athletes who make those Games possible and profitable. But we must also look at the issue from the national federation’s standpoint, recalling the state of USA Track & Field over the last generation, and the job confronting Mr. Siegel when he took the CEO job three years ago. While the Nike contract extension was negotiated without competing bids, still we have to ask what options were available to Mr. Siegel as he went into the marketplace in search of a sponsor last year? Are we to assume he had a laundry list of willing clients at the ready for a sport which has seen itself become the poster child for drug use since 1988, and now sits atop a rumbling volcano of drug allegations and predicted suspensions? The odds are there were few if any such sponsors willing to shell out as much money as Big Swoosh. So you take what’s available in order to try to get yourself out of the hole dug by your predecessors. It’s not dissimilar to the welfare system as it was intended to work. At times people require a hand up. So in order to get the engine fired up again they negotiate the best deal possible, which in the case of USATF was with Nike. And though it comes with some long-standing problems, hopefully in the next generation this money will help seed the renewal of athletics. Of course, the deal is for too little and extends for too long, especially considering that James Harden of the NBA’s Houston Rockets is currently deciding on which shoe company’s $200 million he will feed himself and his family with for the next 13 years. That is one basketball player sponsored for $15 million per year over 13 years, while all of USA Track & Field is sold for $20 million per year over 23 years. But that’s the state of the two sports in a nutshell, like it or not. Hardin is dealing from the strength of the NBA, which, among other things, like all pro sports, has a strong Players Association behind him. Max picks up what change he can, at least giving him some working capital to put a new USATF.TV deal in place, and enough to fund a new $14.6 million athlete budget. Is it enough? Not in comparison to other sports, perhaps, but you can’t say it is nothing or not an improvement. Of course, when you talk to the people at the other shoe companies they question why they should be signing people like Symmonds to lucrative contracts when on the biggest stage on which he is going to perform, he can’t wear their stuff. So, yes, the Nike-USATF contract restricts the marketplace for athletes, and tends to funnel them toward the one sponsor with whom there is no conflict. But fair observers must admit that Mr. Siegel was not negotiating from a position of institutional strength as he made the best of a bad situation where there were no perfect solutions, only compromising ones. At the same time, who should the athletes really blame when they let a lone wolf like Symmonds be not just the standard bearer for their cause, but the sole potential litigant – as he threatens to sue USATF if left off the team to Beijing? We have seen former top track stars Bryan Clay, Jeremy Wariner and Duane Solomon all come out publicly to back Nick’s stand. But none of those guys made the world championship team in 2015. And to date none of the athletes who did make the team have been willing to join Symmonds on his crusade, understandably afraid of jeopardizing their perhaps once-in-a-lifetime opportunity to represent their country at the World Championships. Now recall that earlier this month the top athletes of triathlon successfully joined together to form PTU, the Professional Triathlon Union. Since 1970 when baseball’s Curt Flood challenged the reserve clause that tied every MLB player to the team that drafted him, every other sport’s athletes have found themselves in a similar position, and all have managed to bring about a new professional era of increased athlete’s rights and commerce. These are not easy issues. There’s a long-standing status quo in place that will not give way easily and that has vast power on its side. With over 200 member nations the IAAF is truly an extra-national consortium of national governing bodies, many from impoverished parts of the world where corruption is deeply endemic. Attempting to engineer wholesale change in such an enormous enterprise is at least as daunting as getting Donald Trump to sign onto Fox News Channels’ secret Santa program. But until the athletes of track & field truly unite and collectively bargain, they will have no one to blame but themselves for continuing to be treated if not as serfs, as they were for decades, then simply as independent contractors where any one protester among them can be easily replaced, as Max Siegel has warned Nick Symmonds of being for Beijing 2015. Sorry, Micah. Photo replaced. Thanks for calling me on a basic journalistic courtesy. Unions are good. There is no balance of power if the workers/athletes do not unite. I am afraid that I find your reasoning and examples are a little too facile. To compare the athletes in our sport to NBA or MLB athletes is a false comparison. Whereas the NBA and MLB and NFL, etc., are very Western freewheeling for-profit capitalist organizations generating billions of dollars, where star players are what keep the turnstiles turning and the bottom line looking so healthy, the IAAF and its component federations is an entirely separate paradigm with completely different metrics. A more fitting comparison might be how well athletes are compensated/treated in other federations and what voice they have in the sport’s governance. We can’t and probably shouldn’t try to Americanize everything. So why again wouldn’t we want to be freewheeling and generating billions of dollars and have star athletes keeping those turnstile turning? We went thru this back in the ’70’s and ’80’s when first adidas and then Kappa were signed to sponsor and outfit the USA World Championships, Pan Am, and Olympic T & F Teams. The difference is that we were never asked to sign a contract but we all clearly understood that we would wear the “official” competition racing outfit on the track, warm up suit, awards/podium sweat suit, and possibly a parade uniform. Back then we could all wear out own choice of underwear, jog bra, socks, racing & training shoes, and maybe even carry our own sponsor logo bag to the track. Plus, the places we were supposed to wear all this “official gear” was all pretty common sense and it did not have to be written down. Most all of us athletes back then understood the situation and were cooperative in most every way. I really don’t remember a situation where an athlete “bucked the system” over this. Ironically, Nike was one of the biggest “ambush marketers” around back then and was doing all kinds of creative things w/ athletes, vehicles, and even entire buildings to give the public the perception that Nike was the “real sponsor” of the Olympic Games, World Championships, etc. It’s what helped them grown into the world wide lifestyle/sports marketing company that they are today! Maybe that’s why they are so defensive and possessive now….. I think that the problem that Nick and many of the athletes have is that USATF/Nike (aren’t they essentially the same company now?!) is really broadening the scope of demands that the athletes be in the “official gear” to include too many public places like hotel lobby, restaurant, independent media interviews, etc. and have broadened the “official gear” to include almost everything! I wonder if they are required by this contract to sleep in “official Nike/USATF PJ’s?” It seems to me that this has just gotten a bit too far out of bounds and simply needs to be reined in somewhat and common sense/decency applied with establishing reasonable new guidelines and boundaries that still gives the athletes some amount of individuality and their own sponsors a little bit of respect/gratitude for supporting the athlete for the other 50 weeks of the year. I am disappointed that this situation has been allowed to go this far and get so out of hand. I believe that the language of this contract needs to be reviewed and reformed for more fairness to all and less intrusion into the “private off-track/stadium life” of the athlete while still giving Nike value for their sponsorship investment. It used to work ok so why did we reach this impasse today? I think this is an important subject to cover this weekend and I hope that cooler heads prevail regarding Nick Symmonds so he can compete in Beijing. Thanks for the history lesson, Craig. I remember those horrid Kappa outfits quite well. But this is what happens when institutions negotiate contracts that effect the rights of athletes without athlete representation in the room. When I read the line – “pack only Team U.S.A., Nike or nonbranded apparel” – in the letter to the WC Athletes, I commented to someone that they better be wearing their Nike PJ’s!! Ha, seems you think so, too! As for the mess that is USATF, well, we have a part-time CEO. Max is involved in a half-dozen other ventures and that’s not good. We need a full-time CEO. The Tennis saga to open competition is absolutely the example that pertains. But tennis players have a longer shelf life than track athletes, and therefore with other barnstorming tours available to offset financial losses the old tennis were able to sustain their federation boycott for an extended period until the system broke. Also, back in the ’60s and ’70s there were fewer nations with top athletes in tennis, making it slightly easier to unify them. Athletics is so dispersed with many top athletes, many quite young and inexperienced in business, it will prove quite daunting to get them all on the same page when there is no alternative to the federations-based Diamond League, World Championships and Olympic Games. A tough situation with no easy answers. It sounds like the TFAA really needs to step up to the plate. 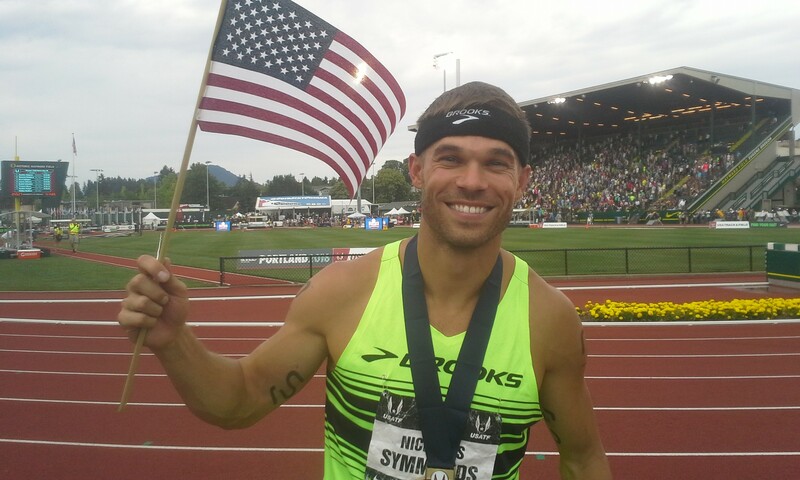 Time for Brooks Shoes and other Symmonds sponsors to help Nick! Bc, he ain’t going if he doesn’t sign the papers! Toni, you don’t seem to address the basic reason Nick’s objecting: I don’t think he’s opposed to the national uniform in comp, he just doesn’t want to be dressed in the stuff from the time he steps on the plane to the WC and home. Seems to me, the 2 sides could work that out, define better what serves both interests equally. Time long past due for athletes to become their own advocates. That aspect is covered in the “vaguely written” element. The limits and terms of Team USA gear wearing need to be precisely proscribed.